R Leonis boldly boasts to be one the brightest and easiest to observe variable stars in the sky. With a mean visual magnitude range of 5.8 to 10.0, this mighty star can easily be seen without the aid of any costly equipment. As such, R Leo is a favored candidate for new variable star observers and is even cited in the AAVSO list of Stars Easy to Observe. With a change in brightness of several magnitudes and an average periodicity of 312 days, this star is categorized as belonging to the Mira-type class of long period variable stars. Since its discovery over 200 years ago, it has become one of the most widely observed variable stars of its class, giving its sibling, Mira, some competition. "I take the liberty, sir, to comminicate with you several observations which I have made, in various years, of the 420th star in Mayer's Zodiacal Star Catalogue [R Leo], which seems to me to be of some importance. This star...has exhibited very considerable variation in its apparent magnitude. In the year 1780 when I first looked at it in a telescope I estimated it to be of the seventh magnitude, and it was then noticeably fainter than the neighboring star Mayer 419 [19 Leo]...In February of 1782, it was of the sixth magnitude and visible to the naked eye. At the end of April, 1783, it was ninth magnitude, and at the beginning of April 1784, of the tenth..." (Merrill 1938). With recorded data as early as 1903, the AAVSO has archived more than 55,000 observations of this star, which have been contributed by more than a thousand observers worldwide! A 10-year segment of the lightcurve for R Leonis from the AAVSO International Database based on 10-day means. For a look at the longterm lightcurve, click here. Every observer undoubtedly has his or her favorite variable star(s), and perhaps even a special story to tell about the first encounter with the beacon of choice. One notorious relationship worthy of mention transpired between the noted amateur astronomer Leslie Peltier and R Leonis. Peltier was 18 years old when his first encounter with variable stars occured. Only recently had he paid for his first telescope (a 2-inch brass refractor) with earnings he had saved from picking strawberries. Like many new observers, Peltier felt the frustration of not being able to find the variable star plotted on the star charts he had obtained from the AAVSO. However, on March 1, 1918, after many nights of unsuccessful attempts at variable star observing, R Leo revealed itself to the enthusiastic young man: "To my great delight, about a minute later and just a little more than one field to the northeast of omicron [Leo] I found a tiny triangle of stars with R, my first variable, forming one angle precisely as shown on my chart" (Peltier 1999). During his prolific observing career, which spanned over six decades, Peltier discovered a dozen comets, two novae, and contributed over 132,000 variable star observations to the AAVSO. From the age of 18 until his passing in 1980 he never missed sending in a monthly report of observations to the AAVSO, of which he was an honorary member. Even during a hospital stay after suffering a heart attack, Peltier made observations with his binoculars from his hospital room so that he could keep up with his variable star reports. Impressively, Peltier memorized all of the AAVSO variable star charts and often did not write down his estimates until the next morning (Hurless 1980)--this is a practice that the AAVSO does not encourage, however. Peltier was awarded many honors throughout his life, including a honorary Doctorate of Science from Bowling Green State University in 1947. In the mid-1960s, a mountain was named in his honor--an award that many cannot claim. Mount Peltier is rightfully the home of the Ford Observatory, which houses an 18-inch reflector telescope. Those who knew Peltier agree that he was a shy and modest man, and did not like to talk about his many achievements. He attended a few AAVSO meetings, but apparently did not attend any other astronomy conventions (Hurless 1980). Another honor bestoed upon Peltier is an award which carries his name. The Leslie C. Peltier Award, presented through the Astronomical League, is awarded to fellow amateur astronomers who have made observational contributions of lasting significance to the field. Since its inception in 1980, many AAVSO members/observers have been awarded the honor. Leslie Peltier peering through his 2-inch "Strawberry Spyglass" with his 12-inch Clark in the background at his home in Delphos, Ohio, 1968. Throughout his lifetime, Peltier never forgot his first variable star. To commemorate the special bond, "...every March first since that night, whenever the skies were clear, R Leonis and I have recalled our first meeting by making a mutual estimate of our brightness" (Peltier 1999). In his 1986 book, Leslie Peltier's Guide to the Stars: Exploring the Sky with Binoculars, he encourages others to see the beauty in R Leonis that he had seen: "This long period variable can be followed through all of its brighter range with binoculars; its reddish color sets it appart from the other stars in the field. R has always been a favorite star of mine, for it was the first variable I ever found. It's also one of the easiest to find." For those interesed in learning more about the man that Harlow Shapley refered to as "the world's greatest nonprofessional astronomer," readers are encouraged to seek Peltier's autobiography, Starlight Nights (1965, and recently republished in 1999). This book can be purchased through the Sky & Telescope online store. As Leslie Peltier and countless other observers can attest, R Leo is one of the easiest variable stars to find in the sky. R Leo can be seen fairly comfortably through its entire range of variability with a pair of binoculars. However, a small (2-inch) telescope is sufficient enough to reveal its appearance at minimum brightness. The AAVSO has "a" and "b" scale charts that may be used to make estimates of the star's brightness as it changes in magnitude. In both of the above images, south is up and west is to the left. Top: Bright stars in the field of R Leo. Regulus (not shown) is located to the east of R Leo. Bottom: A closer look at the field of R Leo with this STScI Digitized Sky Survey image reveals the triangle-shaped formation. Refer to the AAVSO R Leo charts for comparison star information. Observers will find R Leo located about 5 degrees west of the bright star alpha Leonis (Regulus), in the direction of xi Leonis, and just northeast of omicron Leonis (Subra). Nearby are 19 Leonis, which shows itself as a bright white star, and 18 Leonis shinning in a golden yellow. The color of the variable has been described as a "rosy scarlet" and stands out in stark contrast to its neighboring stars. The area of the variable is easy to remember as denoted by the triangle it forms with the two nearby 9th magnitude stars. R Leo is currently shinning at maximum brigthness (as of March 2001). According to the AAVSO Bulletin 64: Predicted Maxima and Minima for Long Period Variables for 2001 (Mattei 2001), the star will decline to minimum by the beginning of September 2001, with a return to maximum in early/mid-January of 2002. R Leo, as well as any Mira variable, should be observed once a week. When reporting the time of the observation, it is sufficient to record the decimal portion of the day to only one decimal place. As is true with any red star, caution must be used when making brightness estimates. "Many variable stars [such as R Leonis] are decidedly red in color. Because these stars seem to grow brighter if you watch them steadily, estimating their magnitudes should be done by taking quick glances at them so you won't overestimate their magnitudes" (Peltier 1986). For information on contributing variable star observations to the AAVSO, be sure to visit our page devoted to data submission. What Are the Mira Variables? 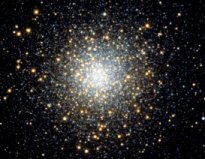 The red giant stars in the M10 globular cluster are seen fairly obvious here as the reddish-orange orbs of light. Image credit: Till Credner, Sven Kohle (Bonn University), Hoher List Observatory. Mira-type variable stars are cool red giant stars that are named for the prototype of the class, omicron Ceti, or more commonly known as Mira. (See the December 1998 VSOTM for Mira.) Such variables are found in the high luminosity portion of the asymptotic giant branch (AGB) in the H-R diagram, along with the semiregular variable stars. (For a review of the semiregular variable stars, see the March 2000 and December 2000 VSOTM for Z Ursa Majoris and Betelgeuse, respectively.) In comparison with solar parameters, stars belonging to the Mira membership of variable stars generally have larger radii, higher luminosities, lower temperatures, and lower surface gravities than our Sun. As a result of the low surface gravity, the outer atmosphere of the star is loosely bound and forms an envelope around the star. Mira stars tend to be of spectral type M, S, and C, and with lengthy periods of 80 to 1000 days, these stars (along with their semiregular relatives) are refered to as long period variables. Mira stars are seen to vary in the visual regime by 2.5 magnitudes or more, and by more than 1 magnitude in the infrared (Mattei 1997). The change in observed brightness of Mira stars is believed to be result of pulsation. The maximum light is associated with the emergence of a shock wave into the atmosphere of the star and the shock wave is viewed as a result of a regular pulsation which is taking place below the visible surface (Willson 1987). According to Olofsson (1999), the red giant stars are divided into two components: "a small, very hot (~108 cm, ~108 K) core that is strongly gravitationally bound, and a huge, much cooler mantle (~1013 cm, ~103 K) at the surface where the external parts are only weakly gravitationally bound." The Mira stars are typically on the order of about 1 solar mass, but undergo substantial mass loss of about 10-7 to 10-6 solar masses per year, whereby the large circumstellar shells are formed (Lattanzi et. al 1997). This mass loss limits the Mira stage to about 1 million years. Those stars experiencing He-burning in the core populate the AGB branch. The AGB stage of stellar evolution is the final phase for the majority of stars in the Universe following the main sequence. It is through this mass loss, however, that they avoid ending in supernova events. When the envelope of the star is nearly gone, an enhanced time of loss with a rapid velocity produces a planetary nebula, and eventually leaves behind a white dwarf star around 0.6-0.7 solar masses (Willson 1986). During this stage of life (AGB) the mass given off by these stars is going into enriching the interstellar medium. Hence, contributing to the sea of stellar life. The red giant stage is ultimately where the Sun will evolve to. For more information about Mira stars, see the Proceedings of the AAVSO Session on Mira Stars Commemorating the 400th Anniversary of the Discovery of Mira in a special edition of the Journal of the AAVSO. The papers in this publication are available online. The above image of Mira in visible light taken by the Hubble Space Telescope (AURA/STScI) for AAVSO Council Member Margarita Karovska (Harvard-Smithsonian Center for Astrophyics) reveals its oblong shape. In a 1996 press release (no. STScI-PR96-26), NASA revealed that Hubble's Fine Guidance Sensors (FGS) had retrieved data showing that perhaps not all Mira stars are spherical, but may be somewhat egg-shaped. The report issued stated that "FGS measurements showed that R Leonis' apparent diameter (in visible light) is 70x78 milliarcseconds (eight by nine hundred million miles at the star's distance of about 390 light-years) along the star's long and short axis, respectively, and 76 by 91 milliarcseconds (with linear dimensions similar to those of R Leonis) for W Hydrae." In addition, an impressive account of size of these objects was also given: "If placed within our solar system, both of these stars would extend well beyond the orbit of the Earth and almost to Jupiter." The observed asymmetry is believed to take place in the extended atmosphere of the star, but the exact cause is currently not understood. It is speculated that the odd shape may be a result of nonradial pulsations (the star not pulsating equally in all directions) or could possibly be an optical illusion as a result of large dark spots on the star, perhaps caused by giant convection cells (Lattanzi et al. 1997). The first indications of this oblong shape were detected in Mira, but through interferometric means have been observed in the stars R Cas, R Leo, and W Hya as well (Karovska 1997). Further investigation is needed to determine the cause of the nonspherical shape and whether more stars can be added to this list. In a world of faster is better, many observers feel that the shorter period, but more unpredictable dwarf nova-type stars are more rewarding to observe since their entire range of variation can typcially be seen within a few days, weeks, or months. Another common misconception is that the long period variable stars are very regular, have been overobserved, and don't need any further monitoring. Nothing could be further from the truth. Longterm data have shown that many of these stars have undergone a dramatic change in visible light output over time. Long period variables are the class of variable star that benefit most from amateur astronomer participation. Automated telescopes simply do not monitor these stars for a long enough span of time. Therefore, we need the help of observers like you to help maintain and extend our database into the future. To help observers plan their observing time more efficiently, the AAVSO publishes the AAVSO Bulletin 64: Predicted Maxima and Minima for Long Period Variables on a yearly basis. Here you will find anticipated dates of maximum and minimum activity for 562 long period variable stars. This is a valuable tool for those observers looking for bright stars to view with their moderate equipment, or for those with more advanced means looking to go after faint minima. Borrowing the words from the 1986 Journal of the AAVSO article by AAVSO President and world-renowned Mira expert Lee Anne Willson: "I will end with a plea to the observers: While observations of other classes of variable stars are important and can seem more exciting than the monitoring of slowly varying Miras, continuing to monitor the long period variables is vital for the development of our understanding of stellar evolution. These stars are also capable of surprising behavior, even after 75 or 100 or 200 years of regularity. Please contiue to observe the Miras!" If you haven't yet started with this plight, then you may consider following in the footsteps of Leslie Peltier by making R Leo your first (Mira) variable too! Hurless, Carolyn. "Leslie Peltier Remembered." Sky & Telescope, August 1980, 104-105. Karovska, Margarita. "High Angular Resolution of Mira Variables." Journal of the AAVSO, 25, 2, 1997, 75-79. Lattanzi, Mario G., Ulisse Munari, Patricia A. Whitelock, and Michael W. Feast. "Interferometric Angular Diameters of Mira Variables with the Hubble Space Telescope." The Astrophysical Journal, 485, 1997, 328-332. Mattei, J.A. "Introducing Mira Variables." Journal of the AAVSO, 25, 2, 1997, 57-62. Mattei, J.A. AAVSO Bulletin 64: Predicted Maxima and Minima for Long Period Variables for 2001. Merrill, Paul W. The Nature of Variable Stars. New York: The McMillan Company, 1938. NASA Press Release No: STScI-PR96-26. "Hubble Telescope Measures Diameters of Pulsating Stars." 1996. Olofsson, Hans. "The AGB-star Phenomenon: Setting the Stage." In T. Le Bertre, A. Lebre, and C. Waelkens, eds. IAU Symposium No. 191: Asymptotic Giant Branch Stars. Chelsea, MI: BookCrafters, 1999, 3-18. Peltier, Leslie. Starlight Nights. Cambridge, MA: Sky Publishing, 1965 (reprinted 1999). Sinnott, Roger W. "Cestial Calendar: R Leonis at Maximum." Sky & Telescope, March 1983, 252-253. Willson, L.A. "Mira Variables." Journal of the AAVSO, 15, 2, 1986, 228-235. This Variable Star of the Month was prepared by Kerri Malatesta, AAVSO Technical Assistant.